This morning I woke up craving pancakes and decided to make one of my favorite quick/filling versions. I actually created this recipe when I was on the CORE program of Weight Watchers. I includes all CORE ingredients (with the exception of the maple flakes). I usually throw this on the stove to cook while I pack up The Husband and my lunches for the day. 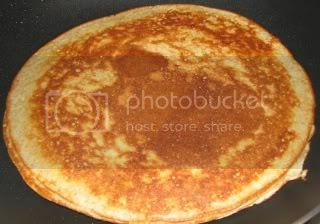 You have the option of making this into one huge pancake, 2 medium size or 4 small ones – the choice is yours. I was pretty hungry this morning so I went for one big pancake. Blend everything together until smooth and creamy. I use my Magic Bullet and it only takes seconds. Cook on a skillet over medium heat (use ns cooking spray or 1 tsp oil) on both sides until browned (about 5 minutes total). Serve up with your favorite toppings – pure maple syrup, fruit, almond butter, etc – the options are endless. I had this fabulous pancake with a about 1 Tbsp Pure Maple Syrup (heated in the microwave for 10 seconds). I love the flavor of the pure syrup and since I do not do any artificial sweetners, the Sugar Free Syrup is out for me. Served up with decaf Starbuck’s Coffe and this was so delicious and filling. I am pretty sure I will not even need my AM snack. Have a great Monday all! See you for lunch and another product review. I make “protein pancakes” with pureed pumpkin! You should try it sometime: pumpkin rocks!! All I do is mix the pumpkin with egg whites (and if you want to add a little vanilla to the mix as well as cinnamon by all means go for it)… and then cook it pancake style… and then when done sprinkle it with stevia & cinnamon & nutmeg!